Eggs! I love eggs. Cooked, baked, pickled…all wonderful ways to enjoy an egg. Last spring, about this time of the year, I spent a wonderful week in Hilton Head, SC. The weather was wonderful, the ocean warm, and the food delicious. Each morning we ended up at Signes Bakery to break our fast. 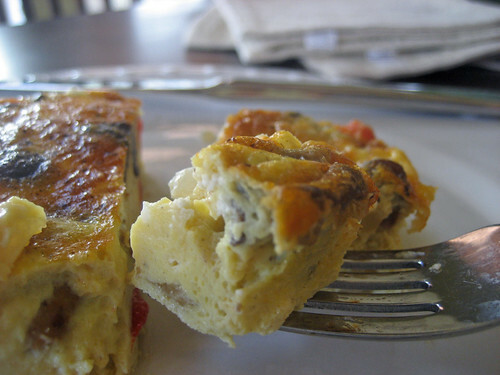 We lounged on the porch drinking hot coffee and feasting on a different frittata every morning. Oh it was good! And their baked goods, well that’s for another day! Lets just say I had dessert after breakfast and something for lunch too! Back to the frittata. I hadn’t thought of those breakfasts for some time until recently. A patient at work mentioned that they had just returned from Hilton Head. After dreaming about warm weather and sand, I thought of all the meals I never got around to recreating (the intention is always there). Hush puppies, lobster bisque, seafood, and everything I had at Signes Bakery. With the thought of Hilton Head still fresh in my head and a nice supply of eggs in the fridge, I decided to try my hand at a frittata. I used foodnetwork.com to learn the exact techniques needed. Its so simple! I did not have a skillet that could go from stove-top to oven (at least I don’t think mine can and my cast iron skillet has gone missing) so I improvised. I used a 9 inch cake pan – hahaha! It worked flawlessly. I had to leave it under the broiler for a little longer than expected because of increased thickness, but besides that … cake pan, however unorthidox, worked like a charm. Next time if I have to use the cake pan again, I will line the pan with parchment paper for easier removal. Turn on oven broiler, place rack in middle of oven. Coat a medium oven proof skillet with olive oil and place over medium heat. Add chorizo sausage and onions, cook until onions translucent. Break up the sausage with a wooden spoon. 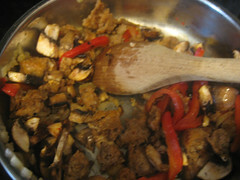 Add mushrooms and red peppers and continue to cook until sausage is cooked through and mushrooms are soft. 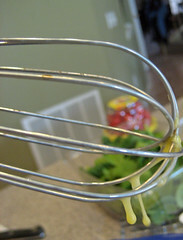 While the above is cooking, whisk together the eggs and water. 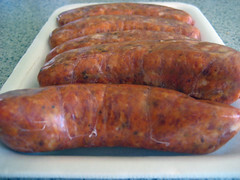 Once sausage is cooked through and mushrooms tender, add the eggs, goat cheese, salt and pepper. Stir to combine. Broil for 5 to 7 minutes or until the top is browned and the eggs are cooked through. 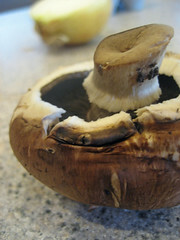 Remove from pan and cut into slices. Grab a fork and enjoy! Mix and match add-ins as you like. 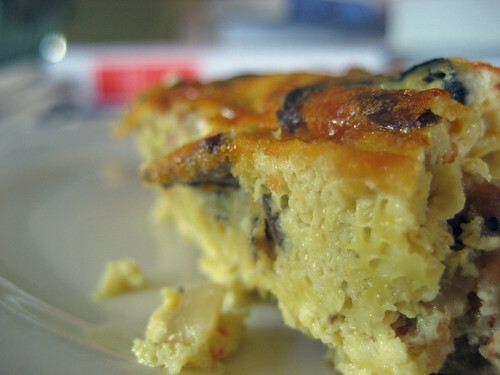 The frittata I enjoyed in Hilton Head was laced with Swiss cheese, ahhh….